I am so happy to finally be writing about this recipe. I have been trying to get a good photograph of this Potato Salad since April 1st. I have made it three times, and each time something happened. The first time I made this for a potluck I went to, where I also brought the Chicken, Asparagus and Rice Salad I wrote about earlier. I had saved a little of it to photograph and when I looked at the pics, the color balance was cold and blue and disgusting. And so was the yellow napkin under the bowl. By that time I had already eaten the salad. Oh well. I was determined to get a great photo of this potato salad because it is so amazing. I wanted the photo to be totally delicious looking. So one Saturday I got all the ingredients and started anew. I was in the middle of preparing the ingredients, when a family member (I won’t say who) started removing the seeds from a papaya in the middle of my cutting board. The seeds were on my ingredients. Finally he left. Then another family member (my lips are sealed) came and started to make Melita coffee in the middle of my cutting board. There were coffee grounds amongst the papaya seeds. Well, he finally left and I resumed making the potato salad. I finished making it and did my food styling. I was really excited because I got to use a new knife and fork I had found in an antique store. I took my photographs and was very pleased. I was looking at them in my computer and decided to compare the photos I had just taken with the previous disgusting ones. Well, poke me in the eye, I must have been totally derailed by the interlopers in my kitchen, because I had forgotten to put the tomatoes in the salad. By this time I had packed everything away and it was dark outside. I had eaten the steak. Happiness is sometimes fleeting. Oh well. So today I was determined to make the potato salad and photograph it, no matter what. With the tomatoes. With the correct color balance. 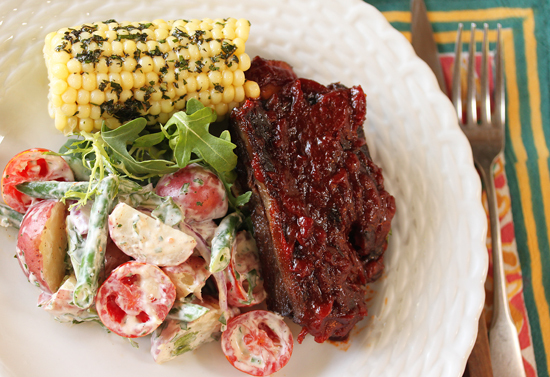 It was Memorial Day and I made a big feast of BBQ beef ribs, corn on the cob slathered with butter that had minced cilantro, basil and mint in it, and my Potato Salad with Buttermilk Dressing. I figured if the photos didn’t turn out, at least we had great food. Which we did, and the photos turned out ok, too. Thank goodness! 1. Cook the potatoes until done, about 15-20 minutes, then cool to room temperature. Cut them into bite-size pieces. 2. Trim the green beans and cut into 2-inch pieces. Blanch in boiling water until they turn bright green, but are still crisp, about 2-3 minutes. Shock in cold water to stop the cooking. Dry with paper towels. 3. 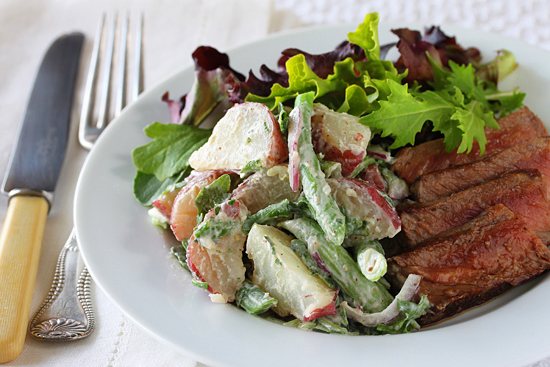 Combine salad ingredients in a large bowl and add the buttermilk dressing, about one cup, or to taste. Adjust the seasoning. 4. Serve with orange chile croutons and hard-boiled egg wedges, if desired. 1. In a large bowl, whisk together the goat cheese, sour cream and mayonnaise until smooth. Whisk in the buttermilk. 2. Add all of the remaining ingredients and stir to thoroughly combine. Refrigerate until ready to use. 1. Preheat the oven to 325 degrees F. Cover a sheet pan with foil. 2. In a small pan, sauté the garlic in the olive oil until just starting to color, about 1 minute. Strain oil into a bowl and discard the garlic. Reserve oil. 3. In a large bowl, pour the strained oil over the bread and stir until evenly coated. 4. In a separate bowl, stir together the orange zest, chili powder(s), salt and pepper. Sprinkle over the oiled bread and stir to thoroughly coat. 5. Bake on a sheet pan until crisp, but not dry, about 12-15 minutes. Hi Lynne, your recipes are absolutely amazing and look so delicious, can’t wait to try some! great post, just found your blog! 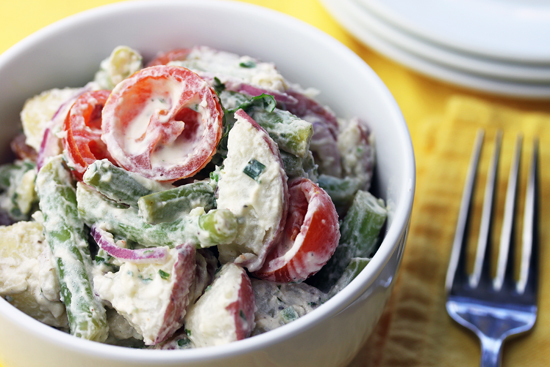 It is really hard to make potato salad look good, even under optimal circumstances. You did an awesome job here! And have absolutely convinced me that I need to make this for my next barbecue. I love that it has both goat cheese and buttermilk in the dressing – way to spruce up a traditional comfort food! 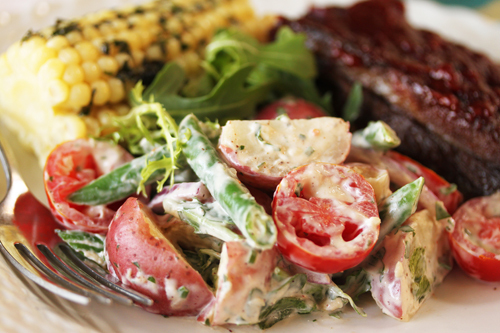 not a big potato salad fan but that looks AMAZING! This was very amusing. Loved how the whole post was about trying to nab the photo. Without those previous attempts, the writing might not have been this good! OK kiddo … when can I come to dinner – this dish looks yummy !!! The article and pictures were wonderful … as always! OK, I am all over this recipe. Your photos have me sold already, great recipe post. Goat cheese and buttermilk have to be divine together. Great idea!! never thought of it even though I love both ingredients!! YUM. I want to make this TODAY, for certain. I even have a cup of buttermilk left over in the fridge and no idea what to do with it! Until now! Thanks! Just finished making the dressing in preparation for Memorial Day weekend. It is fabulous! Just enough variation in the herbs and spices to keep it interesting without threatening to overwhelm the vegetables. The goat cheese is an inspired, if expensive (! ), addition. Brava, Lynne. Well done.